Paces was a dance and drama performance presented by Sheryl Sutton at The Kitchen in 1977. 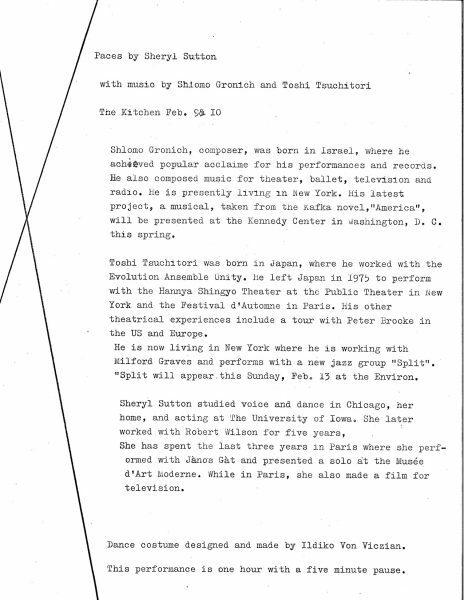 This two part work features a solo dance performance accompanied by two musicians, Shlomo Gronich and Toshi Tsuchitori, and a dramatic presentation. The dance explored the basic movements, or paces, that comprise a routine. The second part demonstrated Sutton’s voice and dramatic skills, in which she vocalized vowel sounds and acted out a comedic scene.